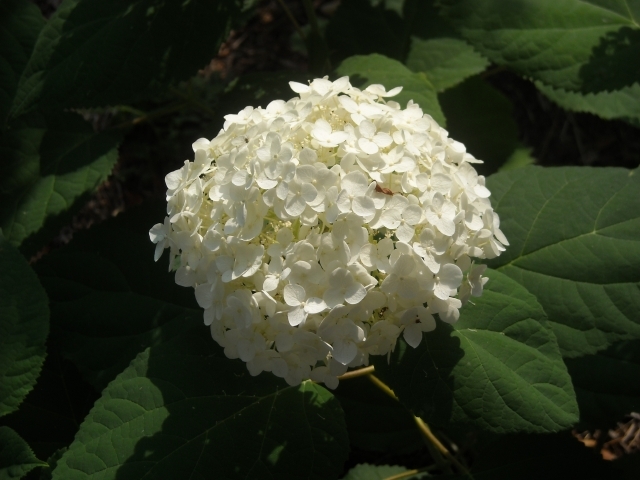 ‘Annabelle’ was our first hydrangea. 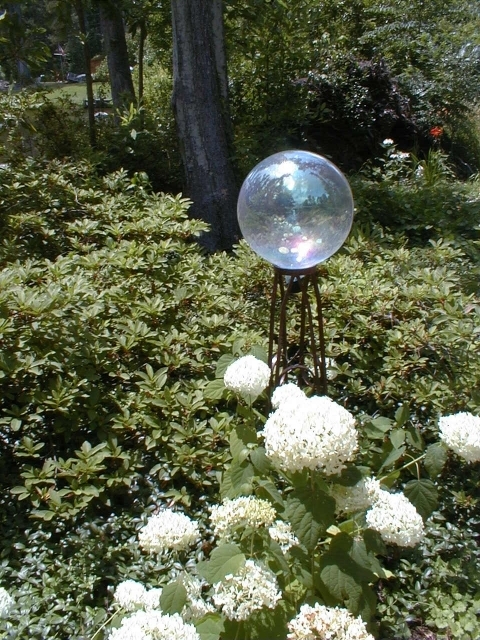 The snowball bush we loved as children. 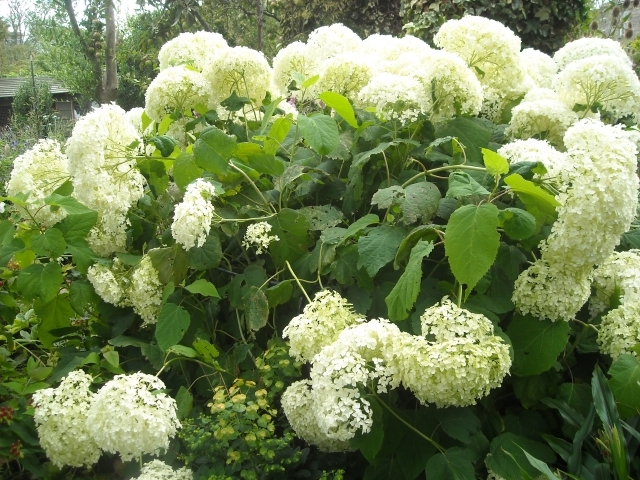 The snowball bush our children loved when they were growing up. When we moved to North Carolina, she was a gift from Bob’s father, who at ninety was still gardening. We found a nice spot for her in a raised bed with good soil near the porch where we could enjoy her blooms and she could enjoy the sun. Apparently she did not enjoy the sun that much. She spent summers wilting. Either we hauled hose daily or watched as forlorn leaves showcased flopping blooms. luminous pale green to bright white to muted sienna as fall approached. There she thicketed for a few years, blending into azaleas and shade trees. We left faded blossoms on brittle stems until spring — the essence of winter against the green of massed George Tabor azaleas. In early spring we cut most stems to the ground or to a green bud low on the stem. No worry about losing bloom. Come summer, Annabelle rose to become a beauty. We could have cut faded blooms during the growing season in anticipation of a second bloom in summer, but we were happy with Annabelle’s gifts in late spring. Nor did we rein in each floppy stem with a plant stake. We didn’t have to. Woodland competition kept our Annabelle blooms small, so stems did not bow. We did not mind the smaller blooms; their reticence gave a certain grace. A little fertilizer, a bit of mulch, and some blood meal in spring to keep rabbits from sampling new growth were the sum of our labor. After Hurricane Isabel changed our landscape, summers seemed hotter and drier. Annabelle began to decline. She never died, but she never shined again. Our only chance to renew our friendship with Annabelle seemed to come when we visited other gardens. There we could see spectacular specimens, ten-foot spread, happy, blazing white – and trouble-free! We missed our Annabelle. One day we were sorely tempted by a particularly beautiful plant at a local nursery. We brought her home and treated her like a queen, lavished her with compost, mulch, fertilizer, even her own drip irrigation head. The deer courted her more vigorously, and they won. In case you want to know the rest of the story, we rescued her and potted her up for a year or so. Conveniently, the deer have left, maybe because they heard a bobcat had come to town, maybe because they have found tastier plants. We have since planted her in the perfect spot. We think. You can sometimes avoid staking blooms if you cut old wood to the ground in spring. Large bloooms form on sturdy new growth. Weaker stems growing from old wood often produce smaller blooms. plant while she was riding her horse in the woods of southern Illinois during the summer of 1910. Harriet and her sister Amy dug some plants, propagated them, and soon the entire town of Anna had this lovely plant with the white snowballs growing in their yards. Some years later, plantsman and professor, J.C. McDaniel, was quite taken with the plant and introduced it to the trade with the name ‘Annabelle,’ after the town and the two belles who discovered the plant. She was quite the belle in American gardens until fickle gardeners jilted her for splashy mopheads from Asia. It didn’t matter. By then Europeans had fallen in love with her, and soon she would be back in American gardens — her charms were too irresistible. And so the gardening pendulum swings. 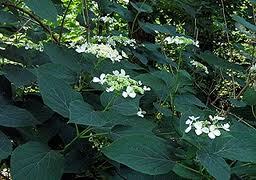 Annabelle comes from a large family of Hydrangea arborescens, or Smooth Hydrangea. 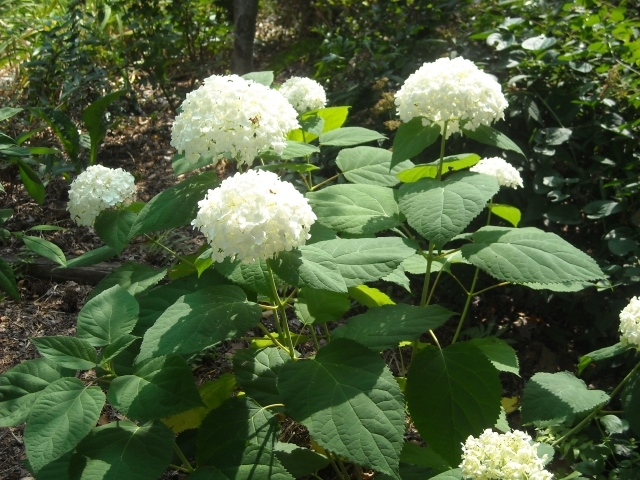 ‘Grandiflora,’ or ‘Hills of Snow’ hydrangea, has been around since the 1800’s.‘Hayes Starburst,’ a recently introduced product of a chance seedling, is sumptuous in cooler gardens. ‘Invincibelle,’ is a new pink-flowered variety, mixed reviews on this one. Incrediball is another. I saw one in a garden and, incredibally, it was upright and perky on strong stems. But I have not seen another since then. As often as we have walked in the forests of the Great Smoky Mountains, only once have we seen Annabelle’s misty, retiring lacecap relative. She roams from New York to Iowa and south to Florida and Louisiana, creating great colonies wherever she finds rich moist soil in a shady glen. Centered in her lace cap are tiny fertile flowers that produce seeds. Ruffles of showy infertile sepals that attract pollinating insects casually rim the edges. Annabelle and her garden relatives may have flair, but this woodland native is a class act.